Kotaku people! Now that Tuesday is coming to a close, we'd better send it off formally with some off topic conversation. That's what tonight's open thread is for, you know? That and delicious, deadly eggs. 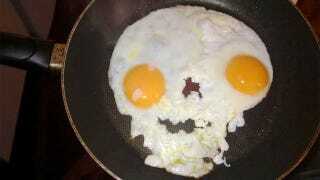 That pic of fried egg skull comes courtesy of PopCap Games, or so I'm told, and has made me astonishingly hungry. I'm off to remedy that. You guys and gals, take it to the comments, but not before taking a gander at some of the following links of interest. Faces, a very cool, sometimes creepy face substitution tech demo - Stay for the Michael Jackson. James Cameron's Avatar coming to Disney Parks - Cameron and crew working with Disney to bring Pandora to Animal Kingdom and Disney World. Tom Selleck's moustache - So versatile! Samuel L. Ipsum - Never use boring Latin again, mothefucker.